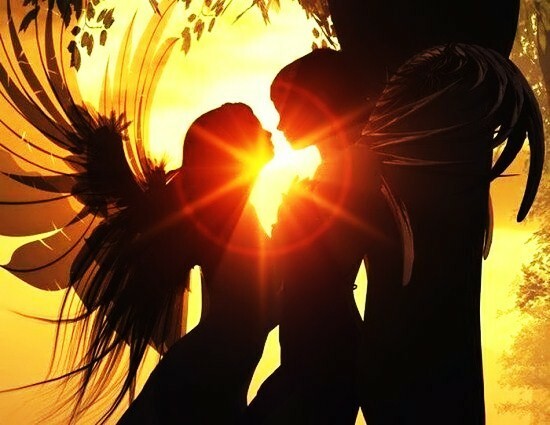 How can twinflames be of different ages if they were created together? Right? The age of the physical body, our biological age, tells you how long your body has been around. This has nothing to do with the age of your soul, which is about how long your soul has been around. Twinflames are created as one Soul. After that, they come on Earth at some point in their journey. And that’s when the First Split happened. So the physical age of the body is basically just a number for the soul. The age of the Soul is same for both Twinflames. The way they think, act, behave… their level of ‘maturity’ and wisedom (at soul level) is same. The physical age can be different… and for Twinflames this will really not matter at all. The age gap between the twinflames can be any number of years. It usually ranges between 20 to 40 years, but I’ve heard of twinflames with age gaps of upto 70 years. Just being together in physical existence together with your twinflame is like a gift. Your souls have finally resolved all the issues after thousands of incarnations, and are ready to reunite, and be back where they truly belong – Together. Twinflames are of the same ‘maturity’ level no matter what the age gap might be. They can enjoy the perfection of Love even if their ages have, say, a gap of 40 years. Age will not effect the Twinflame connection in any way. Its always just as beautiful as it can get… no matter what the age gap is. Having an age gap of 40 years or less is something you should be happy about. Because then you can enjoy a marital relationship… which truly holds the full essence of Twinflames. A twinflame is actually the only relationship of its kind at the soul level. And experiencing the beauty of this wholeness as a married couple in physical form is just amazingly Divine. The age gap depends on the journey of the soul and on the time that it requires to be ready to come in incarnation together with the twinflame. If you’ve got a gap of 20 years or less, consider yourself, and your present life, very special. So that you can truly enjoy the connection while being in your physical (human) bodies. In some cases, the age gap can be upto 70 years (or more). You can still enjoy just ‘being’ with your twinflame. Its just that your souls have chosen to experience it in a different way (which is best for your journey). He visited an Old age home (thats what it was, as far as I remember) very Often. Your twinflame comes in your life in the way which is most appropriate for both of you. Posted on October 2, 2011, in Uncategorized and tagged age gap between twin flames, twin flame love, twin flames age gap, twin souls, Twinflame. Bookmark the permalink. 18 Comments. Just wondering have you noticed the possibility that two people have lead almost parallel lives in terms of their experiences and personalities, continue to have similar experiences after they meet and experience a lot of coincidences after they meet? Are these signs of twin flames meeting? Thank you! Thats amazing …you are truly blessed. I think that I met my twin flame, but he is almost 33 years older than me. There was that instant intese pull we felt for each other, and we love spending time with each other. We are both in relationships, so I don’t know how far we should go(and we want everything). My realtionship is very good, and I don’t think it is smart for me to leave it, becuase my twin is so old, he won’t be albe to be there for me all life. I am interested what do you think about this, what should we do? What would you do if you had fullfilling relationship and then meet twin flame that is 30+ years older? Have you heard of twin flames being the same age? I haven’t. But it is totally possible I believe. My twin was 17 years older than me…I met him once or twice over a couple of years and I just knew there was some bond between us but I didn’t understand it …my husband worked with him for years…when I found out he was sick I felt I just wanted to cry and didn’t understand why I felt like that as I didn’t know him…my husband and I would travel to visit him on weekends and straight away I could feel him reaching out to me…I am NOT a cuddly person…but there were times I just held him like I have never held anyone and it felt like we be longed together…the pull from me to him is something I have never felt…I didn’t care I was going to be there and no one was going to stop me…as the months passed we became very affectionate towards one another…when we were together time would stand still…and we would get annoyed if someone would come in the room…this man I know I gave unconditional love to pass away 18 months ago…I have struggled ….I have NEVER felt physical and emotional pain like this before… So looking for answers as to what this was I was feeling…led me a cross twin flame sites…and it was everything I have read…I can only hope we will be back together some day. I am a 50 year old woman and my twin flame is 30. We have an extraordinarily difficult, dramatic relationship full of nothing but heartache and pain. Not mainly because of our age difference for I look his age like you look your twin’s age. Very interesting 🙂 Our difficulties are deeply karmic with a lot of trauma, betrayal, torture and murder. Our age difference has been baffling us, especially me though, so a few days ago I did some research on the topic. You know what I typed in? : I hate my twin flame! Hahaaaaa! Now that says it all right there… Did I mention we have a very dramatic relationship? Hahaaa! My jaw dropped finding out that having a big age gap and a totally different culture is common for twin flames! This is the fourth time we are together! So your reunion with your twin is very much possible! 🙂 I, too, was married when we met. He was 25, I was 45. It was very hard for me to leave my husband because I really loved him… but the pull of my twin flame relationship was very strong. In our case I was the one to run after two months. Then he came after me traveling 6,000 miles. Then we came back to his home town from where I ran again after two weeks! Although there was a continuity because we left my state together, I count it as the third time because we moved very far away. Between the third and the fourth time two years went by. We have been together the longest now; it has been 1,5 years! Wow! How did we survive? It is fine. There is no ‘rule’ about the age gap.